NOTE: Special NNR Thursday NBA Preview with David Kay of the Sportsbank.com 6 PM Eastern on The Bill Smith Radio Show. Haden personal foul gives KC the ball at the 43. The refs ignored a clip by a KC WR. Good tackle on the run by Ward. Smith catches the Browns in a blitz and throws a perfect screen pass to Browns 32. Rubin sheds the block and nails Davis for a yard loss. KC jumps but the homer refs ignore it. Haden knocks the low throw away. KC 3 CL coming up to bat. McGahee lost 2 No blocking at all. Third down pass is well overthrown. 3 and out for the Browns. D Bryant chases Smith but he gets the ball away for 7. Robertson penetrates to get Charles for no gain. Owens is lying on the ground but clips the foot of McCluster going bye. Chiefs are picking on the Browns LBS throwing to McCluster for the first. For the third game in a row Bess drops his first pass of the game because he is looking for the hit and took his eyes off the ball. He was supposed to be Mr. Reliable. Third down throw is complete for 0 yards and the Browns go 3 and out again. This offense is pathetic. Very slow deep double reverse gets 5. Mingo missed the tackle on Avery. Smith to McCluster for 4. Throw to McCluster to the 38 for 11. Owens on the tackle. Skrine nails Charles for a 1 yard gain. Good line coverage by the CB. Charles on an option run for 7. Found a hole over the Browns right side. END OF THE FIRST QUARTER. KC 6 CL hopeless. Charles off the Browns left side gets 3 and the first. Browns had 11 yards total in the first quarter. Robertson gets Sherman on the swing pass for a gain of just 2. Haden went to get Sherman low and the FB jumped over him to get 9. The KC line is pushing the Browns d back 5 yards off the LOS. Charles gets the 5. Skrine knocks the ball away from McCluster. Browns lose contain again and Smith runs for 23 yards. Mingo got caught inside. Smith throws the ball away with Mingo chasing him. Charles is nailed by Taylor for a small loss. 3rd and a long 10. Screen to FB Sherman for the easy TD. That time Sheard got too deep and the screen pass was round his side. KC 13 CL sinking like a rock. Whittaker gets the KO out to the 35 but a block in the back puts them at the 5. Run for no gain. McGahee was hit in the backfield again. Completed pass for no gain. Catch by Ogbonnaya short of the LTG. Browns go 3 and out yet again. Charles muffs the punt but don’t worry KC is right there to cover it. Kruger cannot cover the TE Smith to him for the 1st. Robertson slides off a block to get Charles for 2 yards. The blitz surrounds Smith but he slithers away for a 4 yard run close to a 1st. The run was marked short by half a foot. Smith wanted a penalty on Robertson for jumping over him as he slid down. Reid challenges the spot and gets the 1st . Bubble screen to McCluster for 6 3rd and 3 from the Browns 35. McCluster was holding his wrist. He has had a history of injury. Taylor reads the screen and Smith threw it away. 52 yard FG attempt NO GOOD. Throw to Cameron by Campbell gets the 1st and the ball to the KC 39 for 19. Flee flicker pass to Gordon for a score of some kind. It has been so long I can’t remember what it is called. The Browns were in max protect with just 2 in the pattern. Gordon was wide open due to the run action and easily got to the endzone. Campbell picked out the right choice and found Gordon. Browns lose contain again and Smith gets 6. Charles up the gut for 14 and the 1st. Haden knocks the ball away from Bowe. Sweep by Charles again Browns lost contain Gipson with the tackle. McCluster on a go route runs right through the Browns D for the TD. This was a total breakdown of coverage. Quick out to Bess for 8. Ogbonnaya runs for no yards. Berry gets him. Lots of wasted seconds. They should have used a TO. Campbell beats the KC blitz and gets the ball to Gordon. Gordon gets the corner and runs for 48 to the KC 26. Throw to Gordon over his head. Gordon was being tackled as he tried to catch it. No flag. Throw to Little knocked away by Smith. Nearly picked. Bess catches the slant for 15. Bubble screen to Gordon for 14 Nice block by little. McGahee runs up the gut for 5. Good protection Gordon inside the 30 on a great pattern. Pass to Little on the wrong side but the WR could not come up with it. KC blitz pressures Campbell and he waddles for 5. The rush collapses the pocket and Campbell forced out for a run of 4.5 yards. 4th and a half yard. This will be a test of the Browns O line. McGahee on the right side good push by Schwartz. Whittaker WIDE open on 1st and against the Blitz Campbell throws the TD pass. That was a great drive by Campbell. 80 yards in 9 plays. Campbell sees the field so much better than Weeden ever did. He has thrown to 8 different receivers. Taylor just misses Smith on a throw to Davis for 12. Smith runs out of the pistol for 4. Good coverage down field and Smith runs again for just 2 yards. Sheard covered the quick slant forcing the run. Throw by Smith to Hall too high. Charles with a knee questionable for his return. Houston traps McGahee for a 2 yard loss. They need to run him up the gut not sweep wide. Barnidge catches the flair for 3. Third and 9. Run by McGahee for 3. Lauvao pulled and led the play. Cameron tackled as he ran a crossing pattern but no call. Blitz but Campbell gets rid of it for a 3 yard gain. No first and the Browns are forced to punt. McCluster gets 11 yard return because there were 4 missed tackles by the Browns coverage unit. Smith steps away from pressure but throws for just 2 yards. The Browns sack Smith by Robertson and Kruger. It was a coverage sack. Smith had no open receiver to throw to. Benjamin runs for 5 but he is hurt. Looks like a knee or ankle. Penalty on the play for Holding on Bademosi. Browns at the 10. Inc to Gordon. Ogbonnaya gets the first to the 22 with a nice block on the left side. Bess with a good block as well. McGahee up the gut for 14 good block by Mack and Greco. McGahee runs the wild cat for 7. Nice to see someone beside Grey run it. No one open down field but Campbell throws to Ogbonnaya. 4th and 2. McCluster breaks 3 tackles for a 21 yard return but a flag. Charles for 4 at the 26. False start. Taylor moved his hand and the O line moved but a hand doesn’t count. No pressure on Smith and he hits Avery for 18 Jackson on the tackle. Good pressure by just 4 man rush sacked Smith for a loss of 4. Taylor gets the credit. Smith quick throw behind Avery. 3rd 14. Blitz gets him. Shear and Jackson combine with Ward. Flag on the punt rush. A Bryant gets the flag. Running into the kicker is declined. Pass to Ogbonnaya caught but Johnson nails him and he dropped the ball. Pass behind and high to Cameron but he brings it in. 1st down KC 36. McGahee gets 9 but holding by Thomas. It was not holding. Thomas just knocked him down which is a cardinal sin of refs. If you don’t see it happen don’t call it. Lauvao and Schwartz both break down and KC gets Campbell for 9. 2nd and St. Louis. Run by Ogbonnaya for a loss of 2 by Berry. 3rd and 29. Screen gets the ball back into KC land but well short of the LTG. Lauvao pulls but misses his block. Punt out on the 3. Holding KC puts the ball at the 1 and a half. Haden flagged for holding. He threw his mouth piece he was so mad. Blitz doesn’t get there but Smith is long on the deep throw. Rubin gets Charles for 4 yards. Big play for the Browns coming now. D Bryant pressures Smith and Skrine knocks the ball away from McCluster. Nice play by the D.
Mingo sacks Smith on a flee flicker. Fasano catches the flair for 5 with Ward on the tackle. Middle screen works again for a 1st for 11. 2nd 18 Browns figure out the screen pass and get Charles for no gain. Browns were in a zone D.
Blitz and Jackson gets Smith for the sack. TO with 4:02 left. 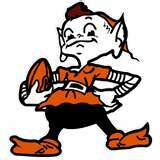 The used TO early in the half will hurt the Browns but not as bad as the muffed punt which cost the team more than 3 minutes. This is Campbell’s chance to prove his worth. Inc when Hali collapses the pocket. False start. The snap did not come up on time. Short crossing to Bess for 6. 3rd and 9 Pocket collapsed again. Cameron gets the 1st. Berry on the tackle. Pocket collapsed again and Campbell throws it away. Campbell sacked and fumbles but KC off side. 2:55 left. Pocket did not exist and Campbell runs for 5. Campbell blasted by Johnson as he throws the ball. Inc to Bess. 2:12 4th and 7. Campbell throws to Bess but he cannot make the catch. Bess came a long way to try to make a play on the ball. FG GOOD KC 23 CL 17. 0:17 left. 9 yard pass to Gordon. Campbell tries to get lined up to spike the ball but there was no time left. The Browns are not good enough to play a team like the Chiefs and survive a turnover. Campbell played fairly well but the team did not start fast. Against a 7-0 team they needed to get a quick score. They went 3 and out on their first 3 possessions. While part of that may have been rust on Campbell for not having played since the preseason part was not good game planning. There were two big plays in the game. The first was the missed 52 yard FG that gave the Browns the ball at the 42. Campbell showed he reads Ds much better than Weeden with a two play drive for the TD. He gets rid of the ball faster and does not stare down his targets. Best of all Campbell did not wet himself when he got rushed. When the pocket broke down he was able to run a little and prevent a negative play. In short, he looked like an experienced NFL QB. The O line was at best inconsistent. On some plays Campbell had pretty good protection. But way too often the pass blocking broke down particularly when the Chiefs brought more than 4. The biggest issues are still at both guards and right tackle. All three will need to be replaced before the Browns can challenge for a division title. The O line was not as easily fooled by the ET twist as it had been in previous games. But Campbell was much better at getting the ball off to avoid the sack. He was sacked only once. That has more to do with him than the protection. The receivers were inconsistent as well. Bess had his worst game as a Brown. Little and Gordon made some nice catches but Little also had an important drop. Cameron had a couple of big catches. He averaged over 20 yards per catch. The running game was way too consistent. The Browns need to be able to run the ball for more than a 3 yard average. On the majority of carries the backs were hit again at or behind the line of scrimmage. The O line has to do a better job of getting to the second level. Unless they do, Jim Brown would average around 3 yards. The Browns put good pressure on Smith and the Chiefs. They recorded 6 sacks. However, the KC O line pushed the Browns D front line off the ball quite effectively. The KC running game averaged 4.7 yards per attempt. The D allowed KC to convert 10 of 19 first down attempts. However, the D played much better in the second half. KC picked on the linebackers in coverage. Throws to the TEs and RBs consistently hurt the Browns and got key first downs. With the exception of Mingo, the Browns LBs are not fast or athletic enough to stay with receivers in the field. Good teams know that and take maximum advantage of it. The loss of Benjamin on punt returns hurt the team. The killer was the muffed punt by Bess. The Browns would have had the ball near mid field and been in position to at least tie the game with a short drive. But Bess again was not looking the ball into his hands. He was looking around and dropped the ball. The team never recovered. Despite a nice effort by the D and overall good play by Campbell, the Browns fell short. The slow first half is an issue that needs to be solved. Other than that the coaches did a good job. The flee flicker worked well. It is clear that the staff made the right decision in starting Campbell. From the 2nd quarter on the O looked like an NFL team. Under Weeden that was not the case. In the NFL there are no ‘moral victories.’ However, there are losses that make the fan base line up at the 280 bridge. This was not one of those because the passing of Campbell gives the fan base some hope for future wins. As I said last week with Weeden behind center the team would have struggled to beat the Jags. As long as Campbell stays healthy the Browns have a chance to win more games.